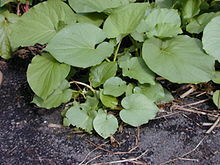 Hoja santa (Piper auritum) is a good-smelling herb with a heart-shaped velvety leaf. The name hoja santa means "sacred leaf" in Spanish language. It is also known as yerba santa, hierba santa, Mexican pepperleaf, root beer plant, and sacred pepper. The difficult taste of Hoja santa is not easy to describe. It has been compared to eucalyptus, licorice, sassafras, anise, nutmeg, mint, tarragon, and black pepper. The flavor is stronger in the young stems and veins. ↑ 1.0 1.1 Barlow, Prof. Snow (2003). "Sorting Piper names". University of Melbourne. Retrieved 2007-03-29. ↑ 2.0 2.1 2.2 Miller, Mark Charles (1993). Coyote's Pantry: Southwest Seasonings and at Home Flavoring Techniques. Ten Speed Press. p. 70. ISBN 0898154944. ↑ 3.0 3.1 3.2 3.3 3.4 Katzer, Gernot (2000). "Gernot Katzer's Spice Pages - Mexican Pepperleaf (Piper auritum Kunth)". Retrieved 2007-03-29. ↑ 4.0 4.1 Rolland, Jacques L. (2006). The Food Encyclopedia: Over 8,000 Ingredients, Tools, Techniques and People. Robert Rose. p. 326. ISBN 0778801500. ↑ 5.0 5.1 "Ingredient - Hoja Santa". The Washington Post. 2004-08-18. Retrieved 2007-03-29. ↑ Pyles, Stephan (1999). New Tastes from Texas. Three Rivers Press. p. 214. ISBN 0609804979. ↑ Raichlen, Steven (2000). Steven Raichlen's Healthy Latin Cooking: 200 Sizzling Recipes from Mexico, Cuba, Caribbean, Brazil, and Beyond. Rodale Books. p. 26. ISBN 0875964982. ↑ Davidson, Alan (1999). The Oxford Companion to Food. Oxford University Press. p. 383. ISBN 0-19-211579-0. ↑ Nordin, Donna (2001). Contemporary Southwest: The Cafe Terra Cotta Cookbook. Ten Speed Press. p. 19. ISBN 1580081800.